People searching for easy ways to improve their dieting success might get some help from one of the world’s favorite spices–cinnamon. Dr. Nicola Robinson of Thames University discussed new research findings for belly fat reduction and improved weight loss in an interview in Woman’s World Magazine, February 28, 2011. In England, people in this study were given 500 milligram cinnamon pills to take daily with their meals. They took one at breakfast, two at lunch, and one at dinnertime. lost 300% more belly or abdominal fat. Some of these people reported that they did not even change their diet, yet lost more weight, as well as showing lower blood pressure and an improved glucose metabolism. Beyond this cinnamon and weight loss study, multiple preliminary studies confirm its benefits for diabetes, metabolic syndrome, cardiovascular risk factors, insulin sensitivity, inflammation, and other health conditions. An animal study showed that dietary cinnamon reduced the accumulation of white fat in the abdomen and improved other harmful effects during a high fat and high sugar diet (Couturier K et al, Cinnamon improves insulin sensitivity and alters the body composition in an animal model of the metabolic syndrome, Arch Biochem Biophys, pages 158-161, September 2010). A human study from Thames University worked with diabetic patients on medication. With added daily cinnamon capsules, patients showed improvements in HbA1c and significant reductions in both systolic and diastolic blood pressure (Akilen R et al, Glycated haemoglobin and blood pressure-lowering effect of cinnamon in multi-ethnic Type 2 diabetic patients in the UK: a randomized, placebo-controlled, double-blind clinical trial, Diabet Med, pages 1159-1167, October 2010). 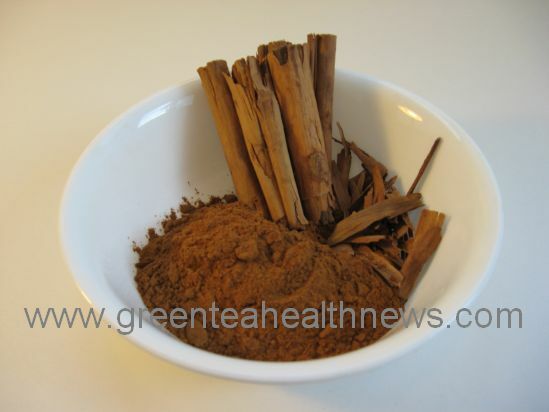 A meta-analysis review of the effects of cinnamon on blood sugar control in type II diabetics. The reviewed research showed improved glycemic control during the 4 month test periods using approximately 1/4 teaspoon up to 1 teaspoon daily (Akilen R et al, Cinnamon in glycaemic control: Systematic review and meta analysis, Clinical Nutrition, May, 2012). Other health benefits may include antioxidant, anti-inflammatory, antimicrobial, anti-tumor effects, cholesterol reduction, cardiovascular, and immune system benefits (Gruenwald J et al, Cinnamon and health, Crit Rev Food Sci Nutr, pages 822-834, October 2010). Are pills or capsules required for all these cinnamon and weight loss benefits? No. This favorite kitchen spice also works when used in more ordinary ways. While the pills are easy and convenient, you can just sprinkle some good quality ground cinnamon (about 1/4 teaspoon) on your meal, in a bit of sugar-free or unsweetened applesauce, or in a healthy smoothie. Or use the sticks for stirring if you choose a tea diet for a happy flat tummy.